For a while I thought that it was an armor vest, but it wouldn’t be made like that with all the fringe and ornaments. It must be for dancing.... The only other thing it could be is x’áan koonáayee, a commander’s leather armor. This fringed moose-hide tunic resembles leather armor but is thinner and more decorated than what a fighter would wear in battle. A warrior’s tunic would also be open on one side to allow freedom for his weapon arm. As a dance garment the tunic might have been worn for the ceremonial reenactment of war. Shamans also dressed themselves in armor to portray yek (helping spirits) who were “spirits of above,” that is, warriors killed in battle. The tunic is ornamented with fossil sharks’ teeth, both real and replicated in carved bone, and with Chinese coins imported by traders. Delores Churchill: Wow, sharks’ teeth. Clarence Jackson: No, puffin beaks. Delores Churchill: No, sharks’ teeth. Donald Gregory: They’re actually bone. Delores Churchill: Are they? They sure look like sharks’ teeth to me. 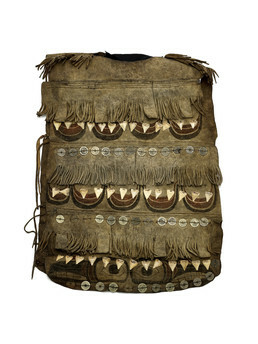 Aron Crowell: This is from Hoonah, 1882, leather vest. Delores Churchill: Chinese coins—it’s decorated with Chinese coins. George Ramos: Yaa ooxóo yáx kawduwa. Donald Gregory: Some of them may be sharks’ teeth, but some of them you can definitely tell are made out of bone. You can see the pores. . . . A shark’s tooth doesn’t have any pores on them at all. Donald Gregory: They’re solid like a tooth enamel, just like your tooth. Over time they get corroded, and they chip and flake like this one. Clarence Jackson: I toowóoch gé, gúl ch’á léix daaka.ádi áyá? Léix goodas’ee. I toowóoch gé léix daa.ádi áyá? George Ramos: Yaanáx aanáx ahéi ayanáax yei kdulátx. Donald Gregory: They made it out of one piece huh? Clarence Jackson: Because of the ornamentation, I was wondering if it was a dance shirt, because it took a long time for the Indian dance gear to really get beautiful I think. Aron Crowell: . . . So you think it’s a dancing vest rather than some kind of armor? Clarence Jackson: I think so. Aron Crowell: It’s thinner too than armor would be? Delores Churchill: It’s pretty thick. Feel it. George Ramos: Is there a design on back? Clarence Jackson: Yes, there is. Delores Churchill: Here, you could [lifts tunic slightly]. Museum Staff: Just a little. It’s one of those spirit faces. Clarence Jackson: Yes, it’s a spirit face again see. Donald Gregory: Almost looks like a moon. Clarence Jackson: I think it was a dance thing rather than a war thing. Delores Churchill: It’s pretty thick. Feel it, George. Clarence Jackson: See it has those designs across and the ornamentation on it. Suzie Jones: . . . But here it’s double thick for a long ways, which seems superfluous for regalia. Delores Churchill: Yes, it does. Aron Crowell: It was listed by McClain as an armor vest but, you know. Clarence Jackson: It could be an armor vest. George Ramos: The only other thing it could be is the commander’s, x’áan koonáayee, a commander’s leather armor. Donald Gregory: . . . It’s made from one piece. It could just be that thick because it’s not like tanneries today that can make it thin and pliable.